IRMA tells ISPs to block piracy hotspots or face legal action. 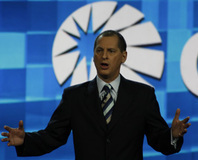 CES 2009: Gary Shapiro, president of the CEA, spoke this morning about how the global economic slowdown will affect the consumer electronics industry through 2009. The IEEE 1394 Trade Association has announced an updated version of the Firewire standard, known as Firewire S3200. The Entertainment Retailers Association (ERA) has called for the music industry to put an end to DRM, citing it as the reason why music sales are declining in the UK. VESA has approved version 1.1 of the DisplayPort interface for use in flat panel displays, projectors, PCs and CE devices. Could the days of DVI and VGA be numbered?